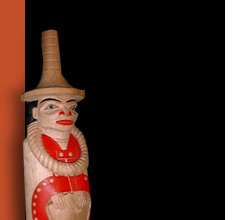 With thirty years' experience in Pacific Northwest Coast native art, Judy is a recognized expert in her field and is very careful about the quality and authenticity of the merchandise sold in her gallery. The high quality independently owned gallery is located in Duncan, British Columbia. 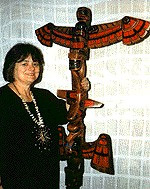 Judy Hill offers a custom order service, provides appraisals on antique baskets and other native art works. Additionally, Judy supplies artwork to interior designers and corporations either for office décor or gifts. Typical custom services include, but are not limited to, having stands and plaques made for presentation pieces. Often artists bring their work to Judy first because they know it will be marketed in a way that they like. "I want people to see items in a gallery environment rather than in a gift shop to realize that they are art forms - not just souvenirs." As a result, many galleries recognize the special relationship that exists between Judy and the native artists and are quite happy to buy through the gallery. Customer service is a cornerstone of the Judy Hill Gallery. The gallery ships worldwide and takes special care in gift-wrapping and packaging. As a customer you will feel welcomed, relaxed and unpressured - "Our goal is customer satisfaction and if we cant help you we will be happy to contact other people who can. We really sell quality and service."